I want to share two of my top self-esteem building activities to inject courage and confidence into your life starting today. It's time for another confidence hack. These are short little actionable tips that you can implement right away to grow your courage and self-confidence. Today is another great example of how a simple idea and a shift in thought and perception is all it takes to give you that confidence boost you need. It's one of those hacks that works better the more you use it. Give it a try starting today and then make an effort to use it regularly. The confidence hack is simple. Make yourself a promise and then make sure you keep it. That's it. If it sounds simple, it's because it is. But like some of the other hacks I've shared with you already, it's more powerful than you may think. By making yourself a promise, you'll accomplish several things. The first is that you define what you need to do. You can't make a promise if you don't know what you're promising. The second is that you are committing yourself to taking action. To keep the promise, you have to do something. Which brings us to the last part of the hack. You have to make sure that you keep the promise you made yourself. 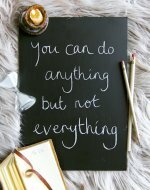 By getting in the habit of doing that, you won't let yourself make up excuses or put things off. Start right now by making yourself the promise to give this a serious try. I want you to promise yourself that you will keep the promises you make to yourself. It's an important part of this hack and what will help build your self-confidence. Think of it this way. Whom do you feel is more reliable and whom are you more confident in? The person who makes big promises, but doesn't always keep them, or the one that will keep his promise no matter what when he's given his word? It's the second one. It's no different when you're dealing with yourself. With this one little commitment and shift in thinking you can greatly boost your confidence in yourself. Best of all, each time you keep another promise to yourself, you're reinforcing that confidence. Let's look at an example of this confidence hack in action. Let's say theres something you want to get done in the morning. This could be going to the gym, reading a book, writing in a journal, or a specific task for your job or business. Define what it is you want to do and then set aside time for it each morning. Then make yourself a promise to get it done each and every morning for a week. Write it down and commit. Stick to your promise and after the week re-evaluate. Is it working? Is there something you need to change? Make those tweaks and then make another promise to yourself to do this task every morning (or Monday through Friday) for another week. Rinse and repeat. In a previous post, I shared some tough love with you and explained why complaining about things isn't a good long-term strategy. In today's confidence hack we're going to piggyback on that idea by eating the frog. Often the thing we complain about is something we don't want to do. It's the thing we dread and keep putting off. We spent more time worrying and complaining about it than is good for ourselves. Worst of all it makes us feel less confident and less competent. Instead of pushing it back and putting it off, we should get in the habit of tackling it head on, first thing in the morning. What do frogs have to do with it you ask? Good question. It's an expression I picked up from Brian Tracey who wrote a book called "Eat that Frog." It's a great read, and I recommend you pick up a copy when you get the chance. The reasoning behind it is this. What if I asked you to eat a frog? Unless you're into French cuisine, that does not sound like an appetizing endeavor. Instead it's one of those things you really don't want to do and you keep putting it off. 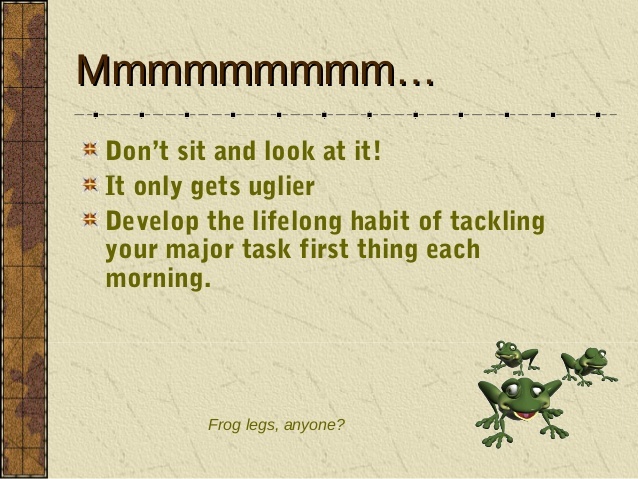 If you just went ahead and ate that frog first thing in the morning, you wouldn't spend all day worrying and agonizing about having to eat it. Instead of dampening your self-esteem and confidence, getting it done right away will boost your self-confidence and increase your courage. While you probably haven't been asked to eat a frog, you've been in plenty of similar situations. Maybe it's the tough homework assignment in school, de-cluttering your closet at home, or doing your taxes. We all have tasks we want to put off, sometimes indefinitely. But doing this holds us back. We know we'll have to get that homework assignment turned in eventually and that taxes will be due April 15th. We also know that getting ready in the morning will be much easier with a closet filled only with outfits we'd actually wear. We also know that doing this work that has to be done early in the day when we have the mental and physical energy to do it will be much easier than trying to rush through it and pull an all-nighter at the last minute. For an instant boost to your self-esteem building activities repertoire, try my FREE CONFIDENCE BOOSTER HYPNOSIS SESSION! More Self-Esteem Building Activities This Way!